Acrylic Display Cabinets are the material of choice under which to display models, memorabilia, antiques collectibles and perform great at product launches, when high optical clarity is required alongside a lightweight and transportable display solution, acrylic display cabinets are perfect for protecting precious or delicate items from dust and inquisitive fingers. The advantage to using acrylic is that when looking to purchase cabinets, they are easily bespoke-made-to-order so you are welcome to choose your own sizes rather than buying from our standard stock range. 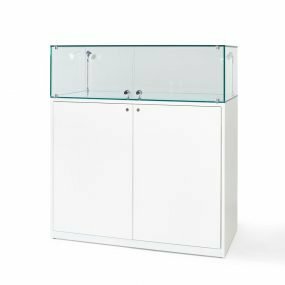 Lift-off acrylic display cabinets sometimes referred to as acrylic display hoods, can easily be secured to the plinths which are made with a small stepped top for the cabinet to sit evenly around, this stops the display cabinet from moving or falling from the plinth or base. Acrylic Display Cabinets can be made with lockable doors, so that if you are displaying items such as jewellery which need to be tried on by clients, you can remove the items when needed and store them securely at other times. The acrylic cabinet above is 400mm x 400mm x 500mm in height, this is a 6 sided acrylic display cabinet with inset base to give location on to the plinth, as standard these are UV bonded made from 5mm high quality clear acrylic and are keyed alike. The acrylic cabinet to the side with stalk lighting is 400mm x 400mm x 200mm in height and is one of our 5 sided acrylic display cabinets. These are also UV bonded and locate securely to the top of our plinths by means of the rebate that is cut into the top of the plinth. The acrylic cabinet below is 400mm x 400mm x 400mm in height, is a 6 sided display cabinet with locking door and inset base. 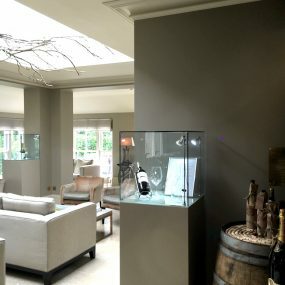 Acrylic Display Cabinets are bespoke made to order. Usual lead time is 7-10 working days from the date which you confirm the order. On occasion this can be more or less depending on the current workload for the bespoke team. If your interested in acrylic display cabinets, Get in touch now by calling 01934 708 717 . Alternatively, talk to us directly using our online chat system or use the form below to contact us and we will get back to you with your quote for an acrylic display cabinet. If you would like to secure your display cabinet to the plinths, an 18mm rebate in the top of the plinths means security screws can be put through the sides of the acrylic keeping it held down, in a manner that should the plinth be left unattended it will not be tampered with. 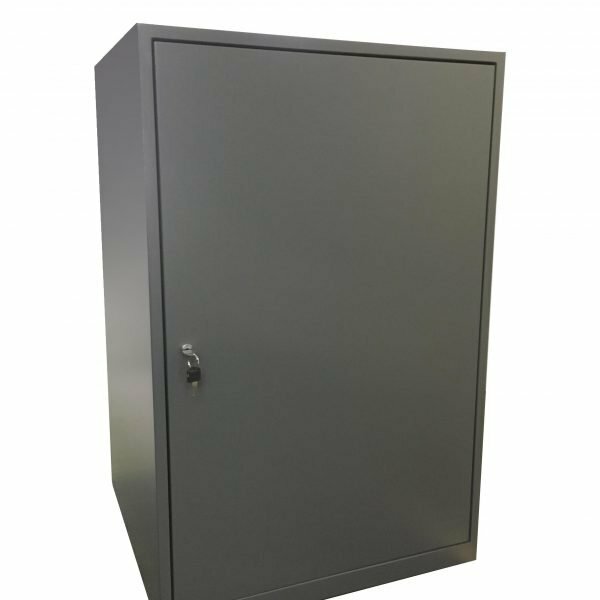 In order to maximise the storage in your space, you could add a lockable door to the plinth beneath and shelves if you wish to. This means you can use the inside of the plinth to store your items, belongings and stock if you are short of space on an exhibition stand or in a retail space. Please speak to Ellie with regards to how you can maximise usage of your items.